Hi, I’m Rosanna Gordon, a British Wheel of Yoga qualified Teacher living and teaching Hatha yoga classes in Liverpool city centre. Classes are suitable for all levels, beginners to more experienced. I’ve been studying and practising yoga since I was 21, and want to share what I have learnt and experienced with you. My aim is to help you to feel good both on and off the mat. She does this by creating a warm and nurturing environment, in which everyone feels welcome. Her positive and upbeat approach enables students to feel good about themselves and in their bodies. Rosanna firmly believes that yoga is not just for the fit, slim and flexible and that it can be incorporated into anybody’s everyday life, no matter how busy they are or how impossible it sometimes feels. 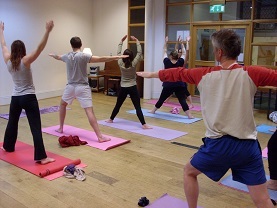 Come along to a Hatha Group Yoga Class or book a One-to-One Yoga session today. Take a look at the timetable and see what suits your schedule.